Kentucky Notary Seals and Stamps. 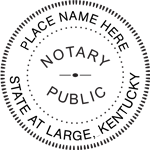 Customized with Notaries Information. Choose Product Below and Customize. Fast Shipping on our Notary Supplies.